41+ Best RV Space Saving Organization Accessories and Hacks of 2019 + Video Walkthrough! Genius Camper Organization Ideas, Hacks and Accessories from a Pro! Bathroom door hinge towel storage! If you run out of space in your RV medicine/vanity cabinet, hang up a travel toiletry bag for more storage and organization space in the bathroom! RV Storage Ideas for Clothes? Remove the hanging rod and use a set of plastic drawers! Check under your bed for available storage to put larger bins of items such as extra jackets, linens and toiletries! If you do keep your hanging rod, get a hanging sweater organizer to keep clothes seperated and accessable! 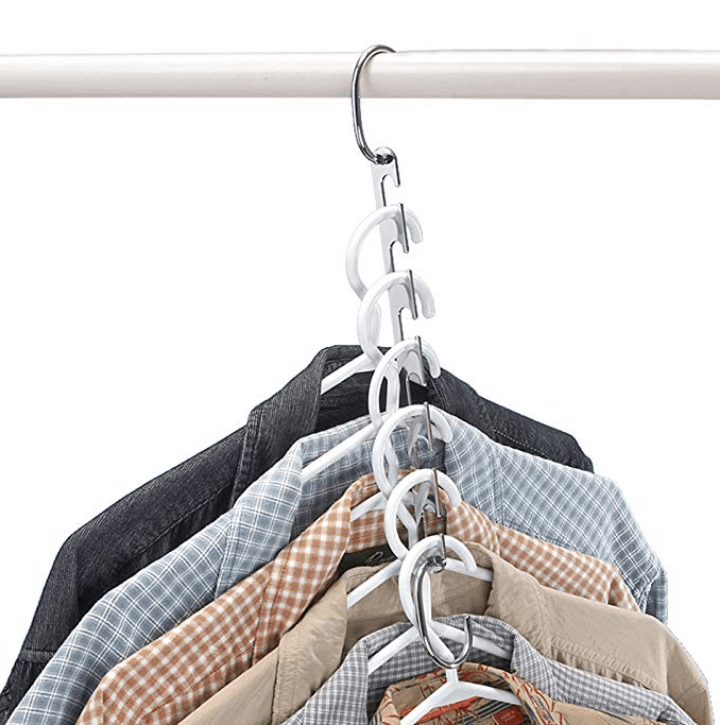 Another option to organize your RV closet – cascading clothes hangers to save space! Utilize vertical storage as much as possible! Opt for nesting kitchen items whenever possible to save space! Get a collapsible coffee cup that is easy to store and break resistant! Mount your spices on the wall or on the cabinet door! Use under shelf baskets to make use of extra pantry space! Keep everything in your travel trailer or RV pantry secure with these tension bars! 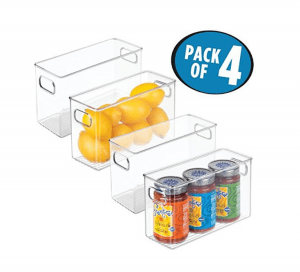 Get this Ziploc Bag Organizing accessory to make more space in those tiny rv refrigerators! Get a grocery bag dispenser and mount it somewhere easy to access! 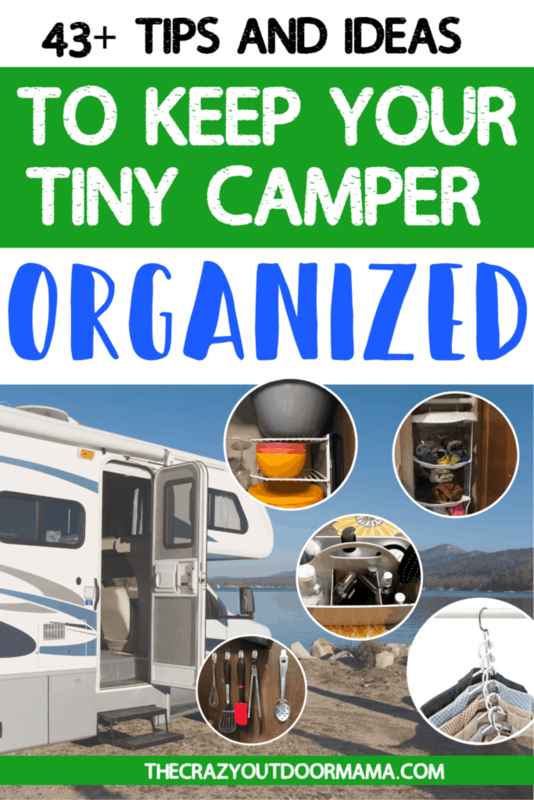 Actionable tips for organization in your camper! Label all containers, and include pictures for young kids! Camping with kids? Check these out! A few more camper organization products! What stops people from being organized when it comes to tiny homes, RVs and travel trailers? I don’t know about you, but I seriously struggle in the camper organization department, and am ALWAYS in search of camper tips and hacks to make better use of my small space. I am too focused on having fun, or chasing kids, or just plain tired to really do any serious organizing! And let’s be honest – it can be DAUNTING to find homes for all the little things we need to have a fun camp trip. Luckily for me (and you now!) I happened to meet Barb through the Instagram, and have since learned so much from her! She has 6 grown kids, and was a certified professional organizer for FIVE YEARS – she owned her own business! 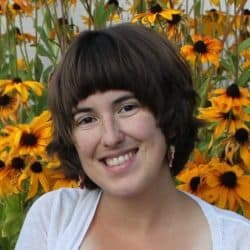 She started RVing full time in July of 2017 in Fred the Minnie Winnie, owns the Organized Kamper, and is sharing her best tips for camper life today! I also wanted to let you know that I am an Amazon Affiliate, and do get a small cut if you purchase anything through my links. But do know these are all awesome items and I’d never recommend junk! You can get a preview of some of the information below in this quick video I put together about some camper organization strategies we use! I asked Barb a couple of questions that I had, as well as some other popular organization problems that come up! Before we start, I want to mention that if you have a small budget, check out the RV items you should buy used here! It will save ALOT of money! 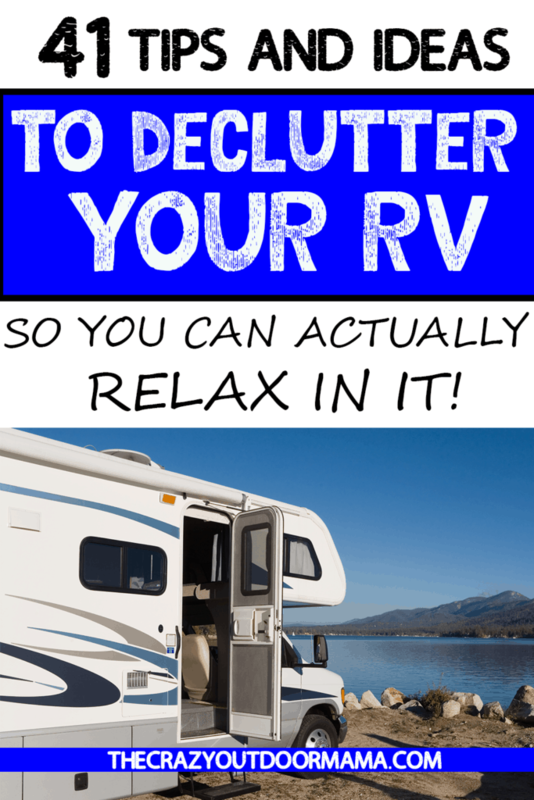 Barb – While it’s hard to make a blanket statement about organization, since each RV layout is different, there are a couple of ways to really make use of the space you have! 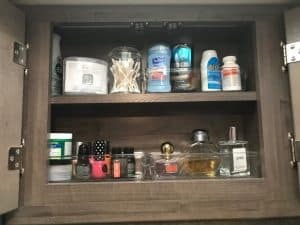 For how I organized my tiny bathroom you can check out my article “Marking the Most of Tiny Spaces in Your RV Bathroom” here! Organizing tiny travel trailer bathrooms is sometimes the hardest area! 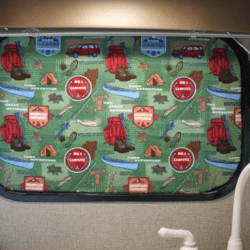 Check out these RV bathroom organizing accessories I LOVE! Besides shoes, it’s also great for toiletries or anything that’s small! I love using Command Hooks in the bathroom, but also just right next to the door for quick grab stuff like jackets and hats! This hanging shower organizer is great for freeing up horizontal space in already small camper bathrooms! This dispenser has exactly what you need – a spot for shampoo, conditionaer and soap! No more spilled or cracked containers that leave a mess, and you don’t have to take up valuable storage space in other bathroom organizers storing bulky bottles! Bonus: You don’t need any tools to install this, and it won’t rust! I want to preface by saying ALWAYS measure first, because RVs are all very different than standard, and some smaller ones may not work with this. However, this is an amazing way to to take advantage of that space behind the door! 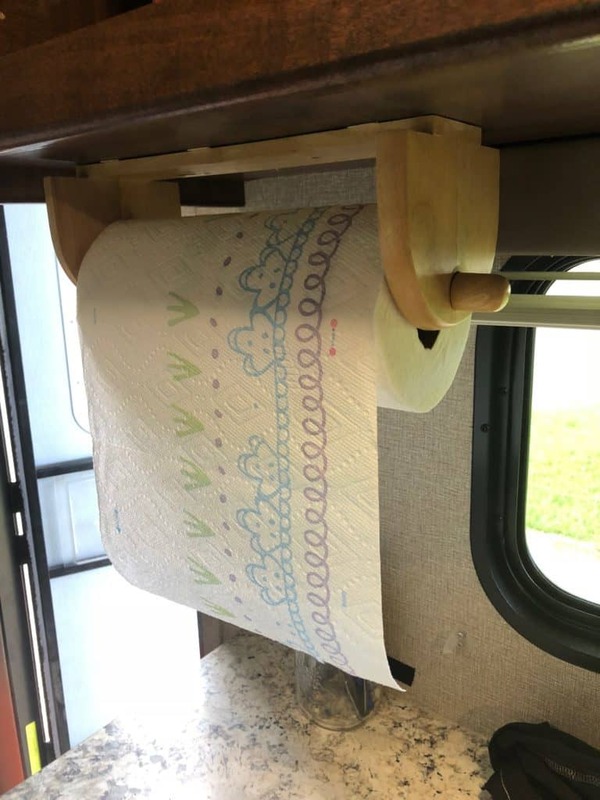 Take advantage of precious travel trailer bathroom space by utilizing the space behind the bathroom door with this hinge towel holder to store and hang towels! If you have any storage space below the sink, use clear containers to store any bathroom essentials. They are easy to see what’s in them and stack nicely! 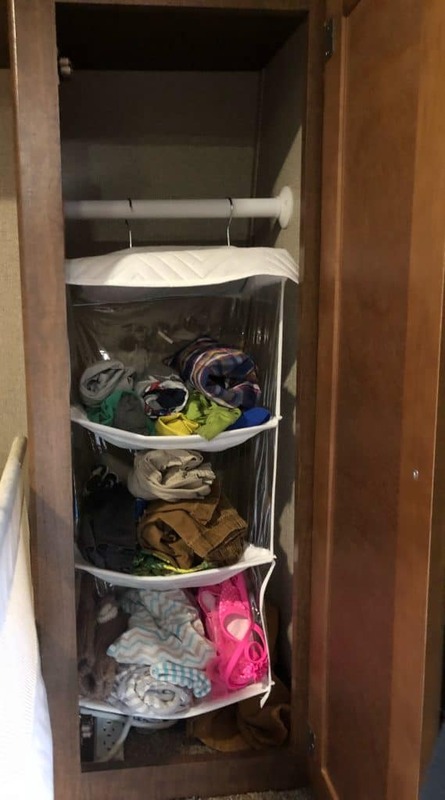 Alot of places do sell the metal slide out organizers for under the sink, but unfortunately, most RVs have much smaller spaces than standard, and are laid out differently as well! These are perfect small containers for under the bathroom sink (or any other small spot) that stack on eachother, and the lids are hinged so you won’t lose them either! This bin is really nice looking, but also made out of plastic so won’t be affected by any splashing water! It comes in 3 different sizes, and is a great catch all for items too big to fit under the counter! A lot of campers don’t have a full size cabinet above the sink, and this works really well to keep things contained and organized. You could additionally add velcro to the back of the containers so that they all don’t spill out when you open it for the first time during set up at a new site! Everything is organized so neat in this camper cabinet! If you want the look, check out these bins that were Amazon’s Choice! We all know that travel trailer medicine cabinets are SMALL – and if you are a traveling family, it’s likely everyone’s things aren’t going to fit in there! We love using two of those travel toiletry bags to get more space – just use a command hook on the wall, and hang your bag there once your parked! I love that it can be zipped up, secured and put away during transit since typically it has alot of my small items that can get jostled around and messy while we’re driving! These travel toiletry bags are perfect for additional bathroom storage space in addition to those notoriously small camper medicine cabinets! 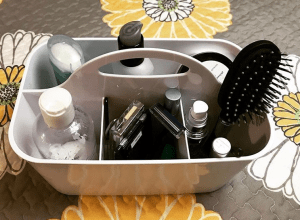 Camper Bathroom organization is a breeze with this caddy! Check this caddy out here! We’ve been places where we knew we were going to stay long term, and DID NOT want to leave our hooks up, pack up and such just to dump our tanks. So that meant that we would take showers at the provided campground shower rooms to save grey water tank space. It’s really convenient to have a non rusting, easily compressed and storable caddy in case you are in this situation! I really like this one because you can even fit a rolled up towel in the middle of it! Save grey water tank space in your camper and use provided campground showers! 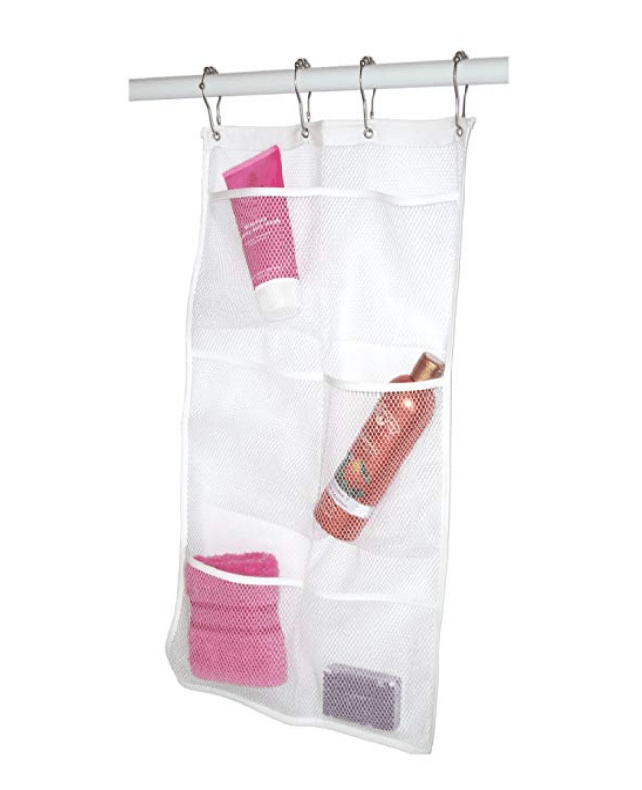 This handy mesh caddy will be able to hold everything you need (towel included!) and can compress down super small when not needed! There’s the pain points (bathrooms, closets) but it’s also important to keep your camper organized in general! Here are some things you might not have thought about! Having a home for everything is the key to keeping organized, so don’t junk up your countertops with keys (car keys, roof rack keys, ball hitch keys, camper keys etc) and all your travel papers! You don’t need anything big or fancy – keep a simple “command center” right next to the door with often used keys and relevant paperwork for your area including brochures and maps! Cords are a quick way to junk up a nice clean counter – and when you only have one or two VERY small counters in small travel trailers, it’s important to maximize every bit of organizatio and storage that you can! This outlet organizer and shelf is perfect to contain cords, and put your phones on while they charge! Control messy cords, and get your phones off the counters with these easy to install outlet shelf! Now a days, most people travel with ALOT of electronics – especially if you have kids and you do so for long periods of time! Phones, tablets, computers, cameras… and it’s REALLY easy to just throw them all in a drawer. Then when it comes time to use them they are all tangled and hard to find! Keep cords for all your devices organized during travel with this charger and cord storage bag! It’s easy to see what you have so you never make an emergency run to Walmart for some charger you forgot! Camper closets are often way deeper than a normal closet would be, so it’s hard to make use of that space. I know ours ends up being a pile of kids clothes that I need to dig through every day to find what I need! I (Stacy, The Crazy Outdoor Mama) only have one closet for all of our clothes – there are five of us! I was really excited about this answer, and I wasn’t disappointed! You can either build shelves or buy a plastic unit with drawers. While the clothes may get more wrinkled this way, you can fit many more clothes in the closet! These drawers are AMAZING! I have 3 sets in my house, and it looks skinny enough to fit in my RV closet! A lot of people have room under their bed for storage. There is normally a light piece of plywood that the mattress sits on that can be easily lifted and accessed. This is great for bulkier items such as jackets and extra towels. 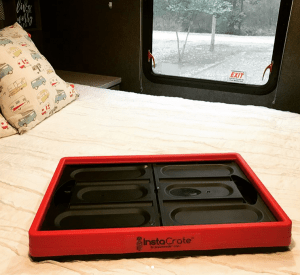 These drawer organizers are perfect for tidy drawers in your RV! I can’t tell you how awesome this hanging organizer has been when it comes to quick changes! It’s great for items you use often such as day and night clothes, swim clothes etc! A hanging closet organizer really helps keep all the kids clothes from turning into a big pile in the closet! This cascading clothes hanger is perfect to organize all your clothes, but also save space! coffee maker (because hubby uses it constantly) and a metal canister with my most used cooking utensils in it. On top of Barb’s advice to ONLY keep what you need on the counter, here are some additional good organizational practices to follow! If you have to store things on the counter, make sure they are stackable. A simple wire shelf can help make use of that awkar tall space in your pantry area! This is one of those things that might persuade me to actually buy new… there are some AWESOME nesting kitchen sets that would save a ton of space in tiny homes and campers! A mixing pot, strainer, measuring cups and spoons all in one “footprint” in your pantry! I also love having a separate kitchen set for the RV (that stays in there!) so I don’t have to pack every time and take stuff from the kitchen at home! I know everyone has their favroite coffee cup (my husband has one that says “Camping is In-tents” LOL) but they do take up alot of space, and tend to break really easy! You could buy a cute tin one (there’s alot!) or buy one of these nice silicone ones! Just store it flat when not in use! BONUS: If you hike or explore around, how often have you taken a cup of coffee to go, and then had to carefully store the empty cup in your pack? This one can attach to the outside of your pack, and you don’t have to worry about being gentle with it! Being able to save that precious floor space in your camper is super helpful! With our current set up, we have to bunjee cord our trashcan to the legs of the table in our RV… it takes up WAY too much space when we already have so much to store in there while traveling (bikes, grill, strollers, kid toys etc). Check out this trash can that stores flat! This collapsible trash can is perfect for popping up at camp, then removing the bag and collapsing it back down for travel! Spatulas, whisks, large spoons, and tongs can all be hung near the stove on hooks. 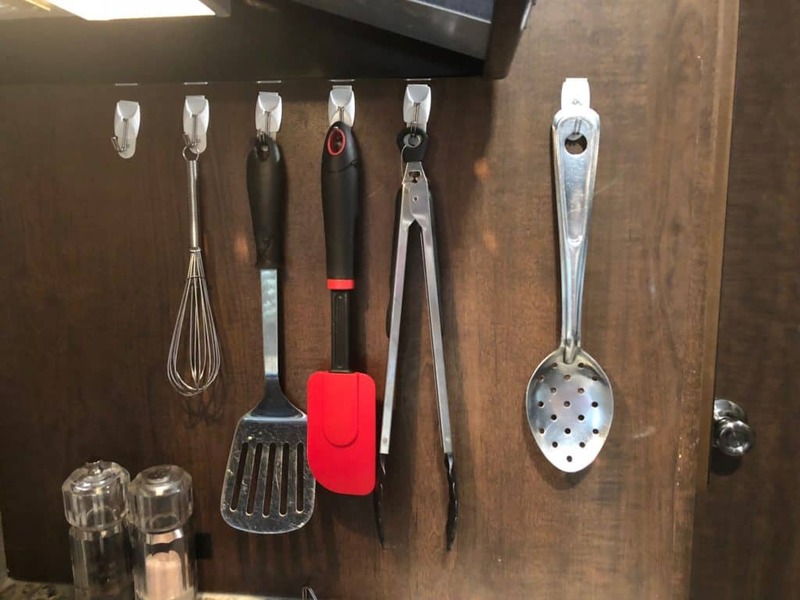 This makes use of normally unusable space (there is not much room between the stove and the wall, so there would not have been room to put a container there anyways) and keeps what counter space you have available! I LOVE having all these larger kitchen tools hanging up on 3M Command Hooks instead of taking up valuable space in our TWO drawers! 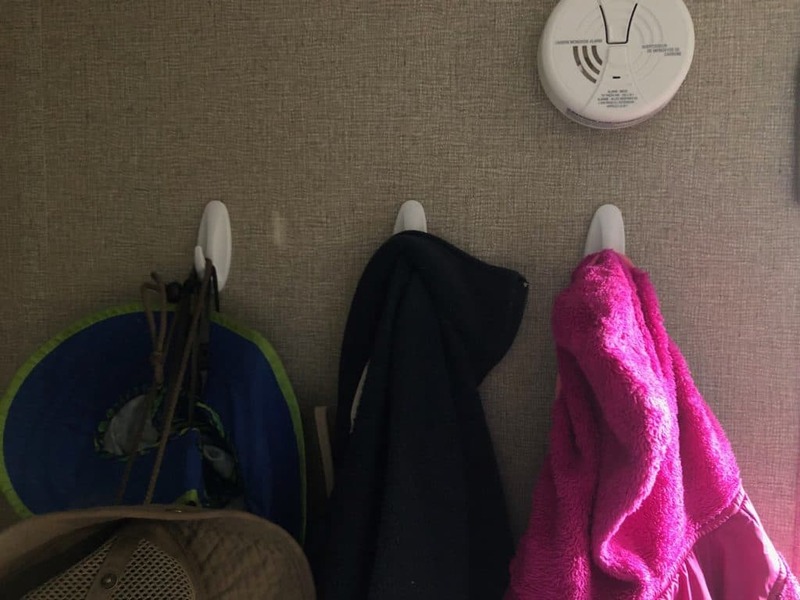 Command hooks of different sizes and shapes are a great rv organization accessory that can really do alot for what they’re worth! I love these “spice grabbers” because they are just stick on (but very sturdy!) so no toolds needed! They also prevent the spices from rattling and such against eachother like a normal spice rack would do! It’s hard to tell from the picture, but with this spice storage set up you just pop them into the holders! They are kept nice and secure without any rattling while driving! I don’t know about you, but our pantry only came with one shelf… so it was 2 or 3 feet tall in each section! It’s really hard to use vertical space without shelves, but if you find your space is just small enough to fit shelves, you could use this under shelf basket instead! I can’t TELL YOU the amount of times we finally got to our destination, all the kids need to go potty (and me!) and we open the camper door and see all the contens of our pantry all over the floor! Keep everything tidy with these adjustable tension rods! Imagine all that on the floor after a big turn! These pantry tension rods will keep your RV tidy and reduce major spillage while traveling! This might be handy for salt and pepper, a “junk” bin (such as a very small container with keys, change, and other small things) and whatever else might move in transit. 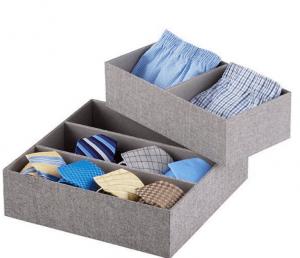 This isn’t as important if you stay in one place for long periods of time, but if you are constantly moving, velcro can really reduce the amount of set up time needed! 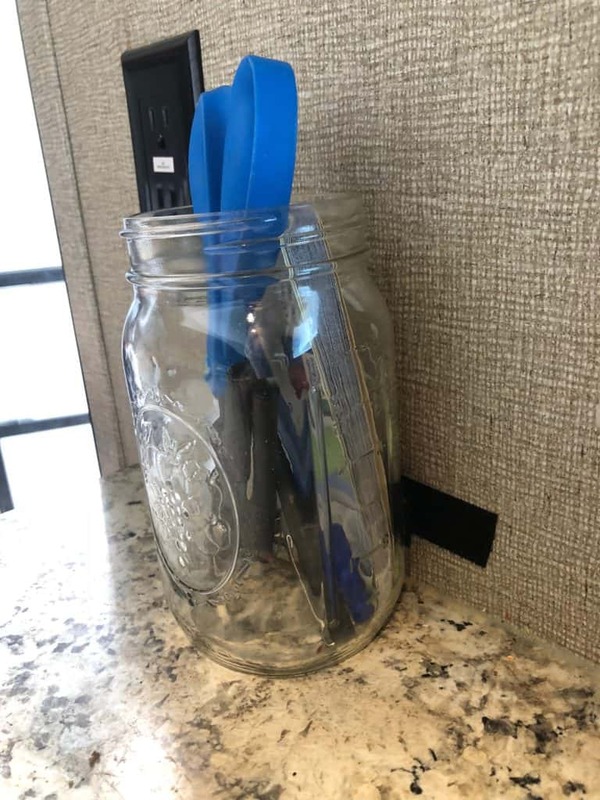 This easy to use velcro securely holds our “stuff” mason jar while in transit! This is handy so that when the dishes are done, you can set the whole rack in the sink instead of using up table or counter space. It’s also helpful because all the drips will go there instead of having to use a rag or drying mat! This drying rack came from the dollar store, so check there first! It’s really convenient to have a place to store it when not in used! 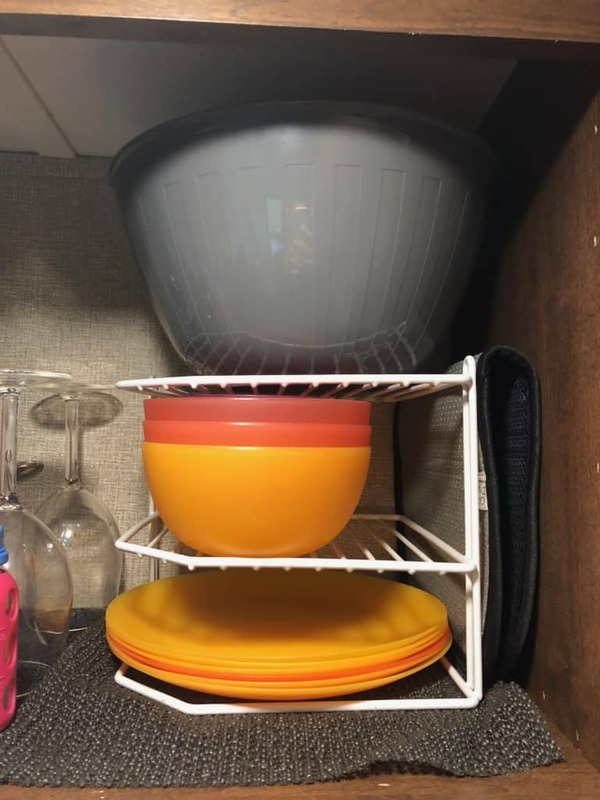 Here is a similar small dish rack and here is an awesome foldable drying rack one I didn’t know about when I bought it! Just wanted to restate this info from Barb. Unless you are using the items every hour, or need to be able to access it quickly, it doesn’t need to be out. 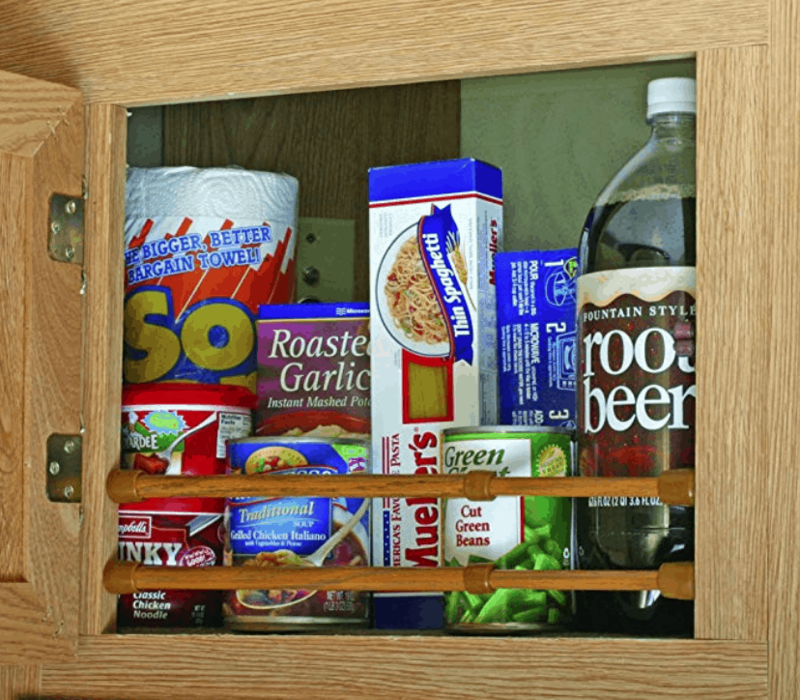 It’s much easier (and your camper stays neater) if you just take the 10-30 seconds to remove the item from the cupboard/pantry, then put it back when you’re done! All items have an away place that is OFF the counter! 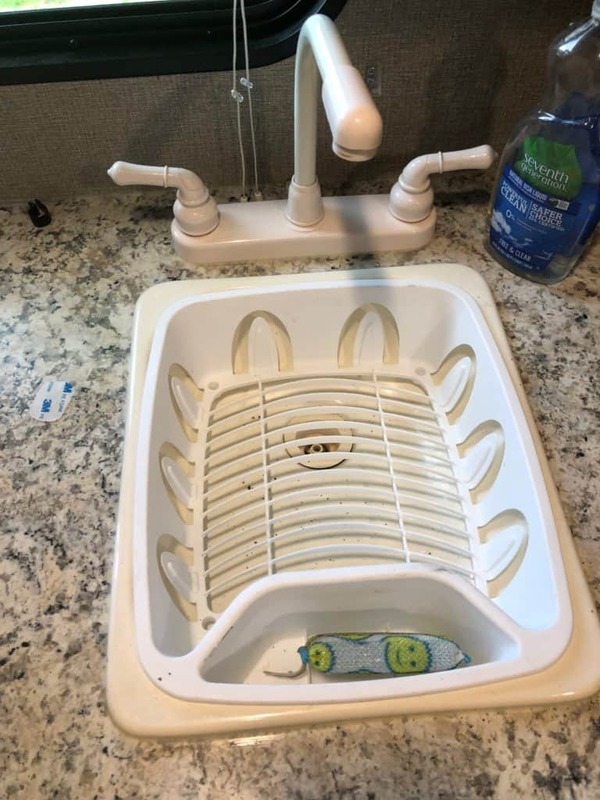 Though it may not seem like much room, they take up a bit of space, especially when you think about the fact that you have to have room to pull a paper towel off the holder! We bought one that mounts under our cabinet area (we have a small cabinet for dishes above out counter) and it is convenient to use and out of the way! I love having our paper towels mounted, especially since they are right next to the door for easy access! I love using the clear bins because you can easily see what’s inside of them! Alternatively, you could just tape together some cardboard boxes and label what’s inside! I also love this idea because you can prep everything for your trip ahead of time by stocking the RV Fridge Bins and storing them in your home refrigerator until it’s time to go! RV refrigerators are so small, so it’s good to have everything contained and organized with bins like these! This is a GREAT way to plan out your meals for the next day (sandwiches, meats, veggies etc) and have them organized, easy to see, and not taking up shelf space! If you’re a parent, you’ll ESPECIALLY love this because as we all know, kids are all about snacks! Now you can see everything clearly, and make meal planning for your trip that much easier! Chronic snacking and meal planning families rejoice! This ziploc bag hanger and organizer saves precious shelf space and prevents those bags of meals or leftovers from becoming lost or forgotten! I LOVE grocery bags! I use them for everything! Dirty diapers, recycling, food scraps… however if they are all balled up in a bag and pushed to the back of the cabinet, I’m lazy and sometimes don’t – that’s why I love this beautiful dispenser! You could also make a DIY grocery bag dispenser here ! This grocery bag dispenser is nice and slender, and would fit perfect inside an RV pantry door! – Don’t just wait for the next day you have time; that will never come! Instead, write it on your calendar, tell your spouse, and make a plan of it. If you are already mentally prepared for it, then it won’t be as bad or overwhelming. And if a day seems like a lot, commit to organizing one space, or organizing for a certain amount of time such as 1 hour. – Unless you really need them, get rid of the 3rd whisk, 4th extra blanket, etc. I’m really bad about stockpiling blankets because I always fear a sudden ice age will come – or so you think based on the number of extra think blankets I bring! – This isn’t from Barb, but in my personal experience, I get alot more done if I don’t have my phone easy to access. I usually start with good intentions, such as before I met Barb, looking for “Camper Organization Hacks” on Pinterest. However, I then go down the rabbit hole of related pins, and before I know it my hour slot I had to clean during kids naps is up and I’m left frustrated that I accomplished nothing! This makes it easier to clean up since everyone knows where things go and they don’t pile up. – If you put things away in small amounts, you won’t end up with an overwhelming mess at the end of the day! Who wants to see that as soon as they walk in? I don’t want to walk in the door of Fred and stare at a bunch of dirty dishes! They might also attract bugs or mice if left sitting for too long! This kind of goes with the 1st tip, but it really helps to put everything away if everyone knows exactly where each item belongs! – I have a hook with each kid that has their day and night clothes. In the mornings when I’m half alive, it makes it easier to change everyone into their “Adventure” clothes as I call them because they are ready to go on a hook by the door. At night, when everyone is exhausted and screaming, it’s super easy to grab their pjs (and swaddles!) and get them to bed without digging around looking for the things they need! – With smores, peanut butter, syrup, and all the other goodies camping brings, it’s super easy to get the camper messy! Since they are so small, it doesn’t take much to make it look dirty. Keep a rag by the sink so that IMMEDIATELY after meals it’s easy to clean up! 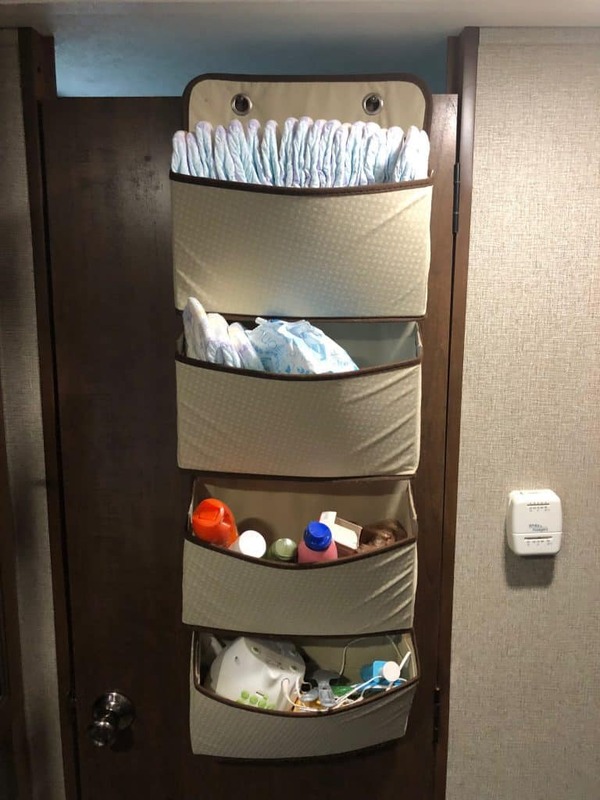 If you have kids, you especially know how much little stuff comes with them – diapers, medicines, gadgets… I love this hanging organizer to keep it all easy to access! The 7 best tips I have for getting babies to sleep in your camper – I have twin babies, so you know I have all the deets! I have a toddler too, and yes, it’s possible to get some sleep while RVing with toddlers as well! Check out how here! Haven’t gone camping yet? Well get the kids pumped for getting outside with these 13 adorable camping picture books! 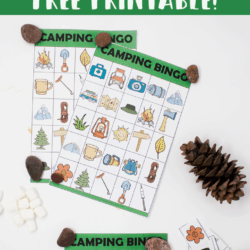 How to keep kids occupied at the campground with these fun camp acitivites! 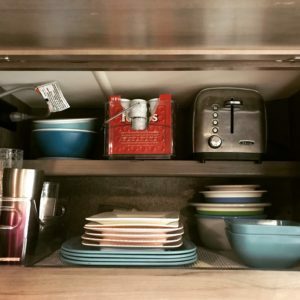 After combing the Organized Kamper’s Instagram, I found a ton of small but handy items to make your RV life that much easier! If you want a full list of what she uses, check out the Product List here! 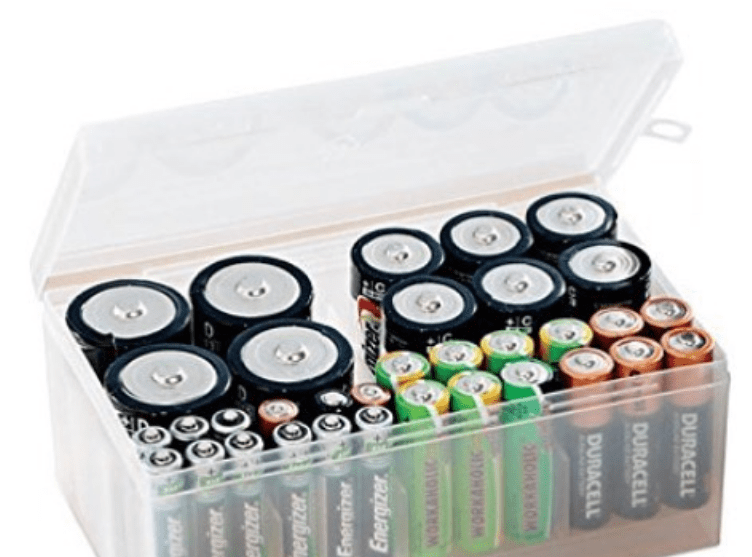 A Battery Organizer – Even at home, my battery drawer is a wreck. It’s combined with a random kitchen gadgets drawer, and all the batteries tend to fall out of the package so that I don’t ever know how many I actually have. Not only does this keep them contained, it’s also an easy way to keep track of what you’re running low on! This would have been handy when my toddler was freaking out about batteries for his toy and I was freaking out because I couldn’t find them! 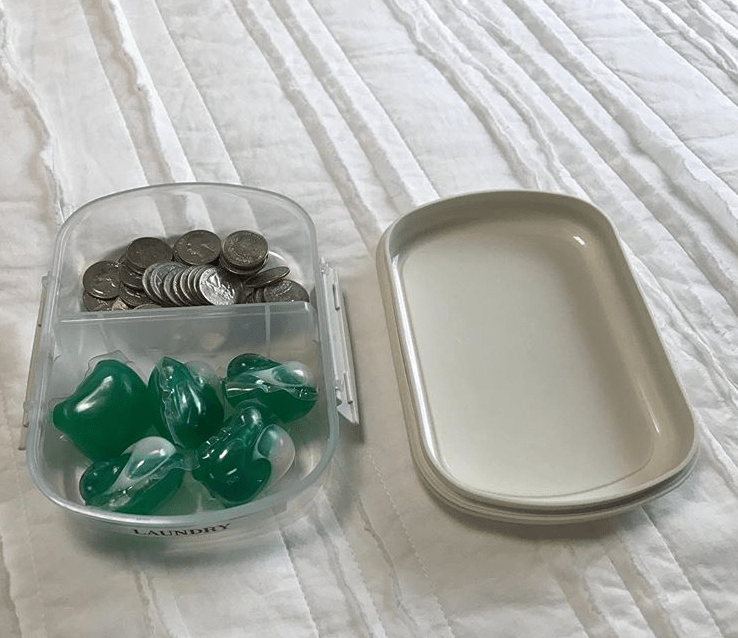 A handy coin-op laundry holder – Whenever it’s time to do laundry, it seems the first trip I ALWAYS forget either the coins or the laundry pack. Barb suggests just using one of these and throwing it in your bag! I seriously need this! I wasn’t able to find it on Amazon, but she said she found it at Target. You could alternatively put a bag of packs inside the bag of coins! Never forget your laundry pack again! 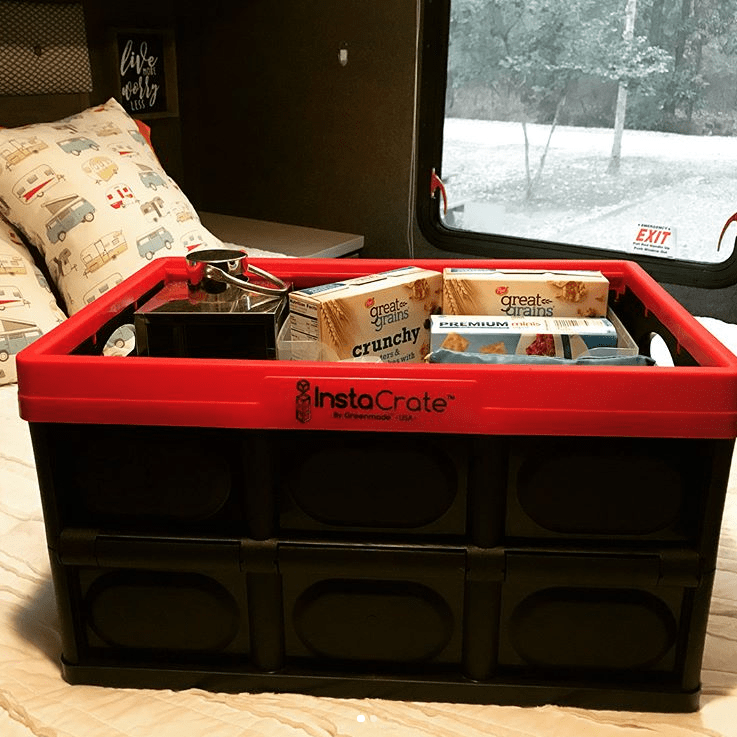 Instacrate Collapsible Storage – These are super handy for things that only need temporary storage, such as counter items or toys for the kids. This is such a space saver! This crate is perfect for keeping things in place while in transit, and putting away when you get to your location! When I worked in Nashville, most of my clients were so overwhelmed that they didn’t know where to start and they certainly didn’t know what the end goal was other than some vague notion of things looking better. Barb -The biggest two problems for people when they want to get organized is actually STARTING to do it and having an end goal. Sometimes it was helpful just to talk them through what they wanted to use the space for, what was working in the room, what they hated about it, etc. they felt much better about letting it go, knowing that someone else would use it. cupboard, or whatever space you are working in. Then you sort like with like, pitch or give away extras or things that are worn out or you don’t use, and then decide how to put them back.